#7. If the Church is not going to be present on this earth during the Tribulation, will people be able to be saved, and if so, how? People will clearly be saved I think during the Tribulation period. We’ve got this picture in the book of Revelation from chapter 7:1-8. Here we have these 144,000 Jewish males, 12,000 from each of the 12 tribes of Israel who I believe will evangelize the world. In the beginning of Revelation 7 in verse 9, where you have this great multitude that no one can number, John asks who these people are. The response is, “These are those who’ve come out great tribulation, they’ve washed their robes white in the blood of the Lamb.” So, clearly there is an innumerable host who are on the earth saved during the Tribulation. These multitudes from Revelation 7 are martyred, so by that time they are Heaven. People are always asking me, “How are people going to get saved if you believe in a Pre-Trib Rapture?” Well, there is going to be all kinds of materials left on the earth. There are going to be people who had heard the Gospel from the people who ended being raptured. There are going to be people maybe who are reading this right now who will then have heard the truth of Jesus Christ and the Gospel. I think the Rapture itself may be one of the greatest evangelistic tools in all of history as millions upon millions of people leave this earth. Ultimately it’s the work of the Holy Spirit that brings people to faith in Christ. The Spirit will still be here actively drawing people to Himself. I like to say there will be great revival during the Great Tribulation. I believe the scenario will be this: the Church will be removed and very, very shortly thereafter God will ordain according to Revelation 7 exactly 144,000 Jewish witnesses. According to verse 9, it is implied that they will be some of the greatest evangelists the world has ever known. The Bible names them by tribe, so they are not the Church. The Church will not be here during the Tribulation. Revelation names them by tribes, but I still find people claiming, “I’m part of the 144,000.” So I ask, “Good, what tribe are you from?” But, yes, I believe those guys are going to preach to the lost during the Tribulation. I would like to add some perspective to all of this. What happens in biblical history when a Jewish person gets full of the Holy Spirit? We have all these Bible records of these guys like the prophets and so forth to give us the answer. Where would we be without the ministry of the Apostle Paul who was a Jewish man filled with the Holy Spirit? Now, we’re not talking about during the Tribulation when just one man will be full of the Holy Spirit. I think of the millions who have been affected by Paul’s ministry. No, we’re talking about 144,000 of these guys full of the Holy Spirit and armed with the Gospel, and they’re going to preach during the seven years like the Church hasn’t done in 2,000 years. Millions will be saved! I do believe that people will be saved during the Tribulation period, even when I’m talking about those people who didn’t hear the Word of God and reject it before the Rapture of the Church. The reason is that John saw a great multitude in Heaven. He asked who this multitude was. He was told these are they that come out of the Great Tribulation. They wouldn’t be in Heaven if they weren’t saved first of all. They are saved and they came out of the Great Tribulation. 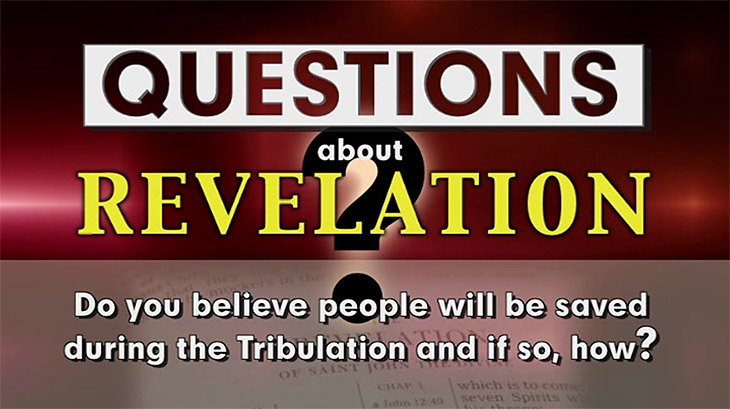 So, I do believe that people will be saved during the Tribulation period. 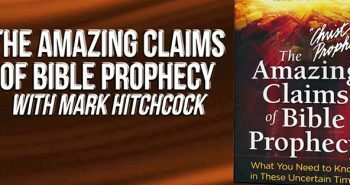 I believe that people will be saved during the Tribulation as the result of the preaching of the 144,000 Jewish evangelists and the Two Witnesses. Also, in Revelation 14 there is an angel who flies through the air and preaches the Gospel to every nation and kingdom and tribe and people on the face of the earth. I want to get across the point that the Holy Spirit does a lot of things and operates in a lot of different ways. The Holy Spirit is not limited to operating through the Church or in baptizing people into the body of Christ. For example, the Holy Spirit was present at the Creation hovering over the waters, but there was no Church. The Holy Spirit was active during Old Testament times working through the Old Testament writers and leading them in what to say, but there was no Church. The Holy Spirit was active through people like Samson, and even over in the New Testament Mary and Joseph, but there was no Church. And so, the Holy Spirit can act and do things without the Church and without baptizing people into the body of Christ. I believe that Jews will be saved in the future during the Tribulation period, but they won’t be added to the Church. 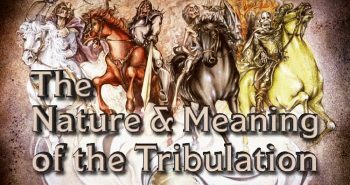 These are the people whom we usually refer to as Tribulation Saints, and they will be saved during that time, but they won’t be added to the Church. 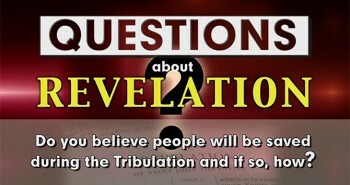 Yes, I believe people will be saved during the Tribulation. I suppose in a nutshell you could say they will be saved in the Tribulation just like any other time that people are saved, and that’s by grace through faith. We understand that, but specifically there are some things I believe that’s going to lend toward the salvation of a whole multitude of people during the Tribulation, not the least of which I believe will be the fact that a lot of people quite simply will not buy into the official government religious explanation for the sudden disappearance of multitudes of people. I don’t think they are going to buy into that. I also believe that there will be a residual effect of evangelization during the Church Age that’s going to carry over into the Tribulation period. For example, Bibles will be everywhere, or at least in the free world. There will be access to Internet sites where people can get information. Not only that, I believe people are going to go to certain websites where authors have left instructions regarding what has happened, what to expect, and what the reader needs to do. When you take all of those opportunities and combine them with the Two Witnesses and the 144,000 Jewish evangelists and the angel that preaches the Gospel, you take all of those things together and you can’t help but see that, yes, there will be many people saved during the Tribulation period. I think it is interesting that whichever man wins the election we will have a president that will get left behind after the Rapture. Romney as a Mormon and Obama as a "Christian" will still be in place as president and will have to deal with the antichrist. I say Obama is not really Christian as NO Christian would EVER EVER EVER EVER EVER slip up like he did and say "My MUSLIM faith". Plus Obama covered the name Jesus in a church where he was speaking and he refuses to say inalienable rights endowed by our CREATOR. In addition to supporting murdering babies on demand and pro gay marriage, Obama is NOT a Christian. I firmly agree with you.. I can say I KNOW HE IS NOT A CHRISTIAN. and if he wasn't so stupid I would think he was the antichrist.. but I do believe he is in league with the Devil. and so are all the Democrats in office.